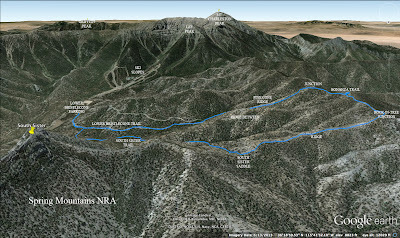 Fourteen hikers started up Trail Canyon in the Spring Mountains this cool morning for another Wednesday "training" hike. 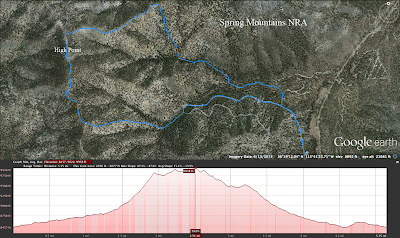 Although the point of the training hikes led by Jon Lubinsky and Larry Shahan was to finish with a climb to Mt. Charleston Peak, it is appearing like that may not come to pass. The North Loop Trail is still closed at the Trail Canyon Saddle due to the Carpenter One Fire that left the South Loop Trail in shambles. At this time, it is not known if the North Loop Trail will open before the end of summer. The wispy clouds that brushed past Cockscomb Peak added to the beautiful morning and the climb up Trail Canyon was relaxed. No one was trying to break their record ... or, at least, no one in the rear of the line of hikers where the writer took up residence today. 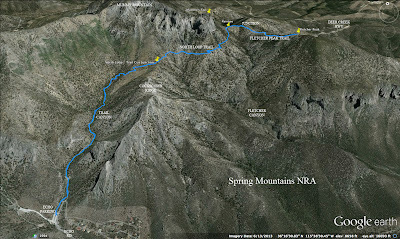 We took a small break at the saddle then continued over onto the North Loop Trail. The scenery on this section of trail is always very photogenic as there are views of several peaks from this vantage point. We could also see quite a bit of the fire damage on the South Loop Trail across Kyle Canyon. 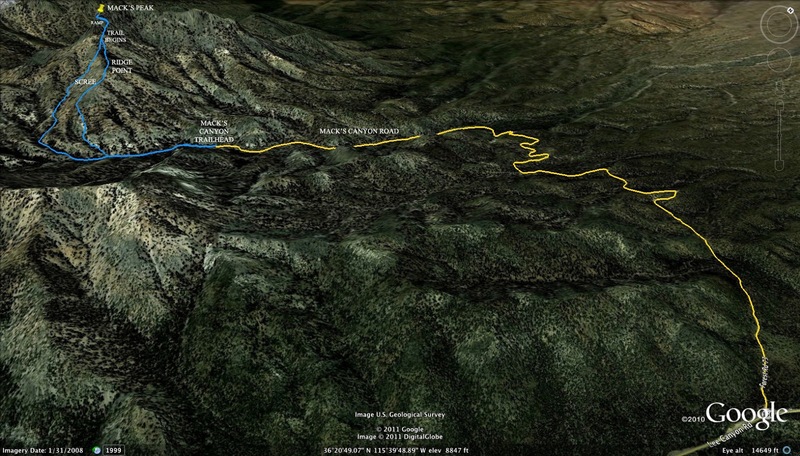 As we neared Raintree, we could see Fletcher Peak and its approach ridge to our right. 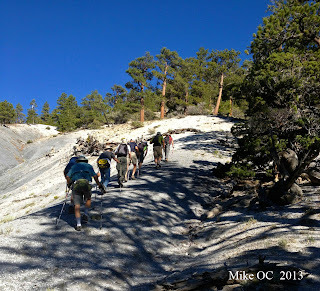 After passing Raintree, the group would circle around and come to the ridge from the left. 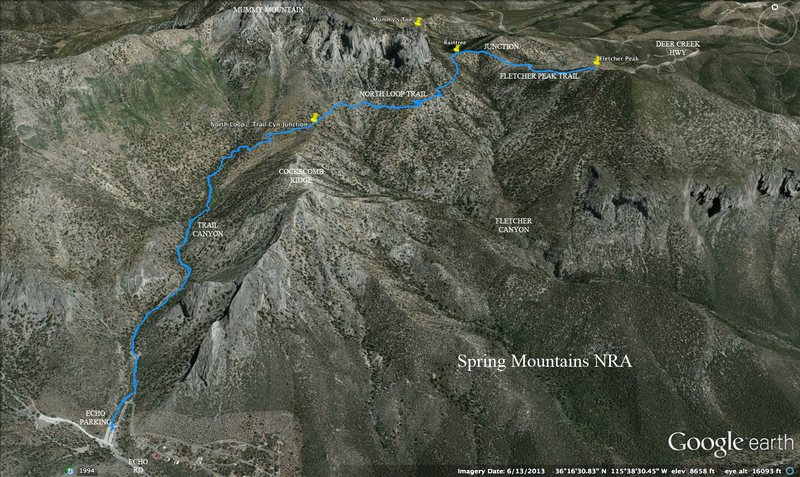 We stopped at Raintree to wait on the last hikers then the writer decided this was as far as she was going to go today. 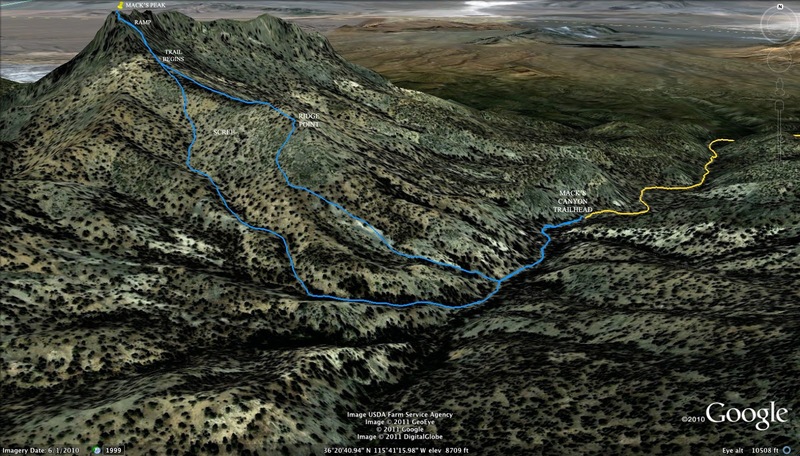 As it happened, there was another hiker who missed the Fletcher Peak Trail junction and returned without summiting. 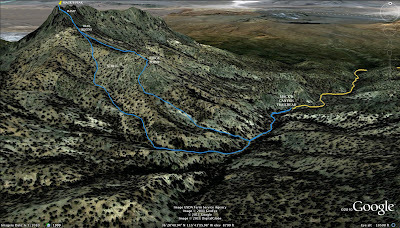 Therefore, twelve out of the fourteen hikers managed to achieve the whole 9 miles out and back to Fletcher Peak from the Echo parking lot. The writer took her time on her return and took a lot of photos that she doesn't always have time to take. The wayward hiker left his name card at Raintree to notify the rest of the group that he was headed down. And, the remaining twelve hikers came down forthwith exclaiming about what a workout the nine miles were. 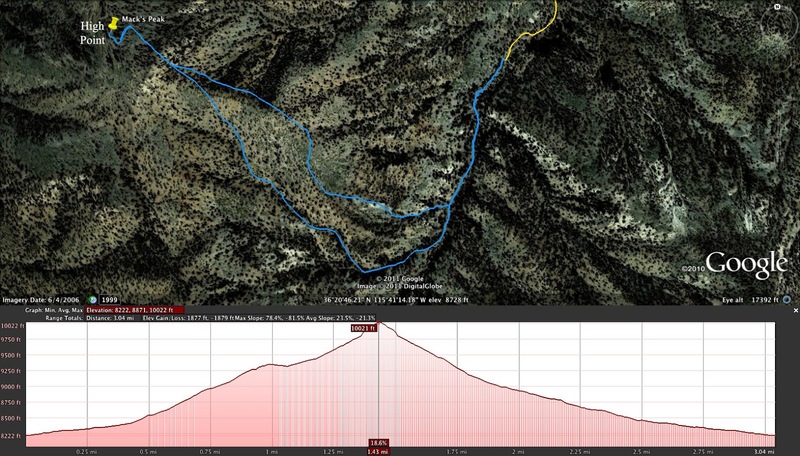 Along with the distance, there were 3445 feet of elevation gain. 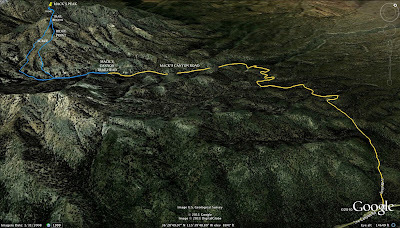 That's quite a hike! ... But, still a gorgeous day! The fire was out, the sun was up, no rain would fall today. 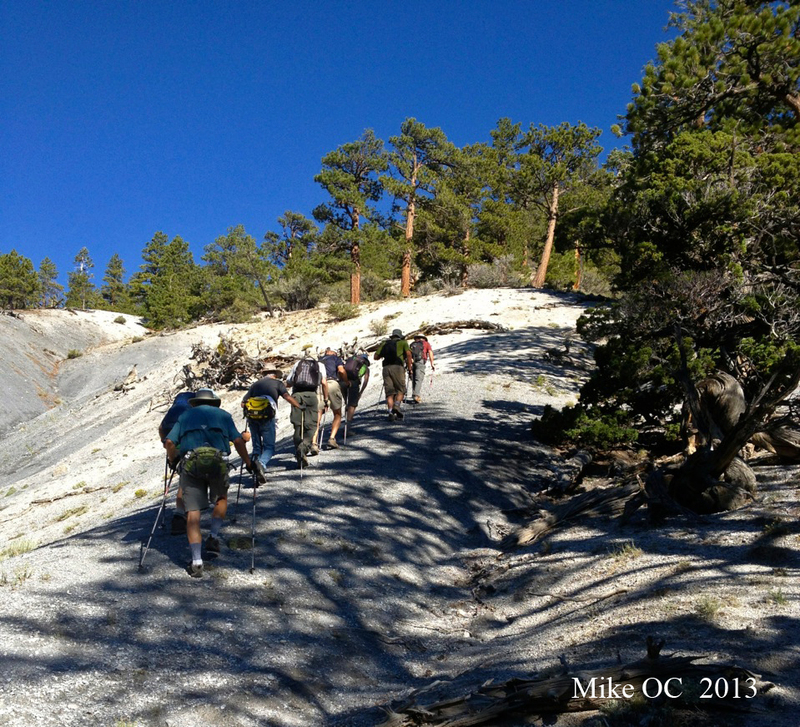 Mack's Peak beckoned from afar, ten hikers made their way. Following a short one-hour drive, nine robust gentlemen and a solitary distaff trekker (the inimitable Susan Murphy) opened the car doors to a crisp, 58-degree morning. 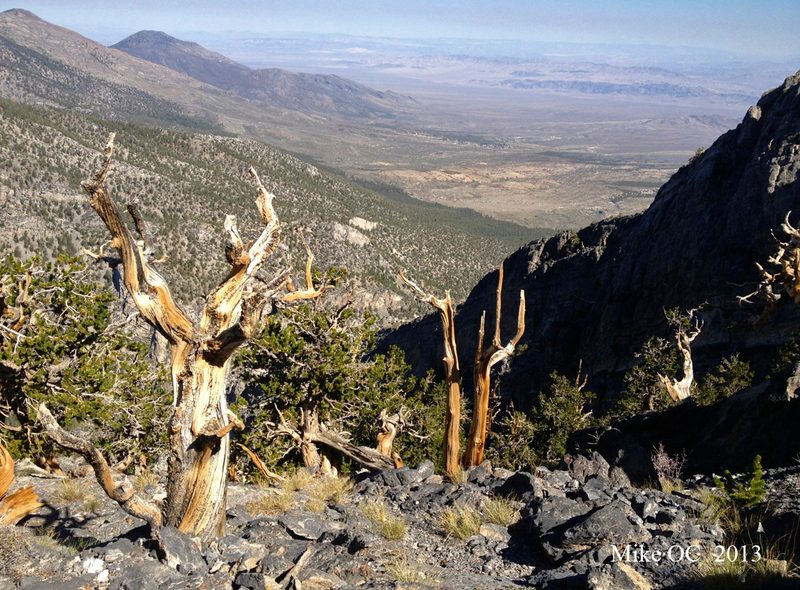 Summers in the upper elevations of the Spring Mountains are an absolute delight. Leaving the trailhead at 8300', the normal Mack's approach up the dry wash was anything but normal and dry. 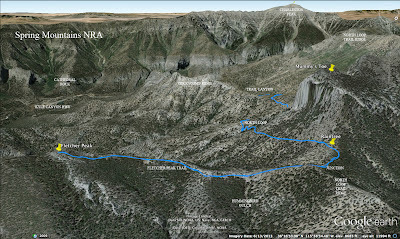 Recent rains were in evidence as a crystal clear rivulet of water guided us up the narrow canyon. Just a tad slippery. 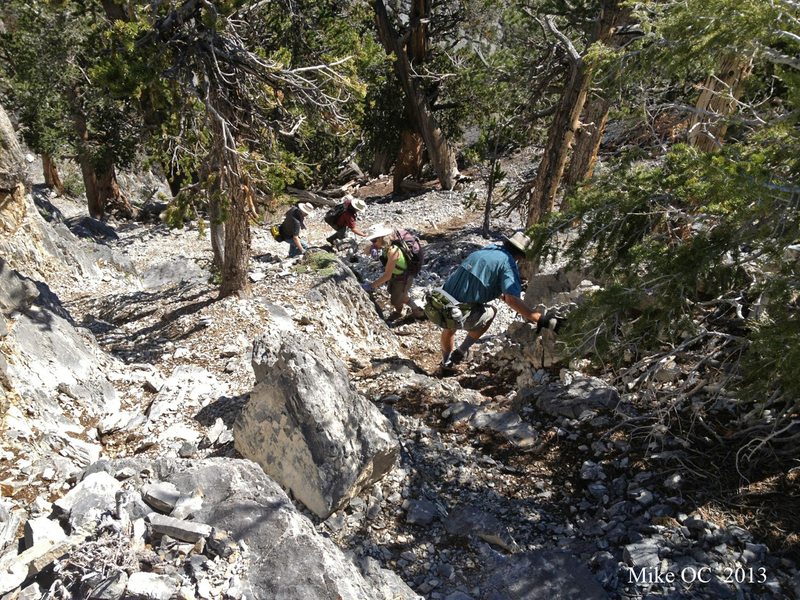 At the base of the final approach, sticks and egos were stowed, as the crux of the hike lay in front of us: 250 vertical feet of steep talus and loose rock. Not a problem for this crew, as the formidable gang of ten inched their way up upward. After an al fresco lunch on the summit, a rousing rendition of 'Happy Birthday' echoed through the canyon as Tim Borem celebrated 52 years on the Good Lord's verdant earth. Good on ya, Timmer. Shall we go down? 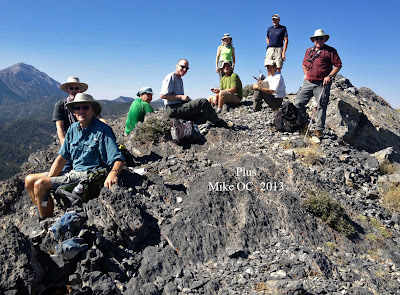 Mack's Peak had our six o'clock, ten hikers bid adieu. Down her flank they scampered, the trek was all but through. 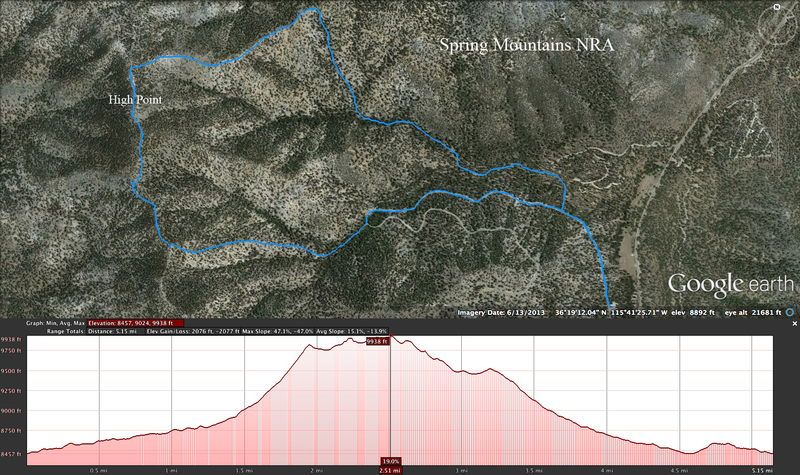 Vitals: 3 1/2 miles, 1800 vertical feet, well under three hours. Happy Birthday, Tim! Still Lookin' Good! There were eight of us this morning. 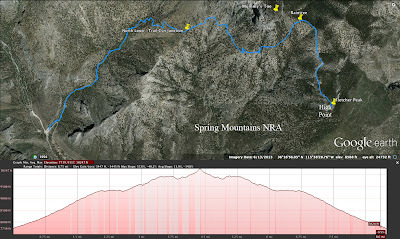 The trail would be another variation of this year's new loop hike involving the South Sister Saddle. 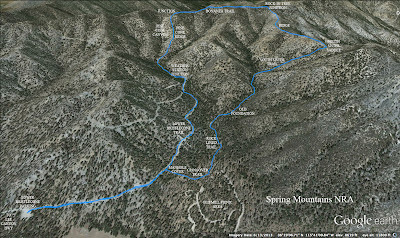 We began at the Lower Bristlecone Trailhead parking lot located off of Lee Canyon Highway. 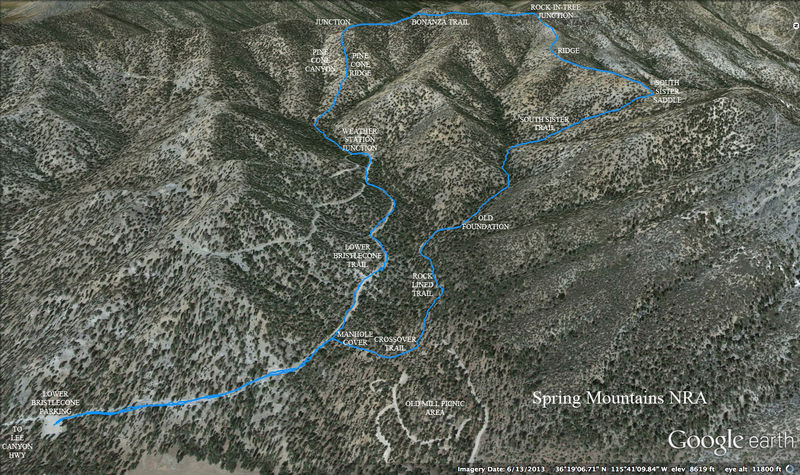 The loop variation would be just over 5 miles with 1758 feet of elevation gain. 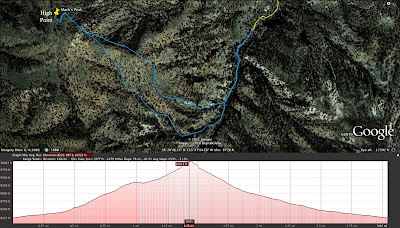 The ridge was steep but not any steeper than the adjacent wash. The views of Mt. Charleston and Lee Peak were beautiful against the cool blue sky. Although the group of eight were each strong hikers, the pace was relaxed and we climbed the steep hillside slowly. 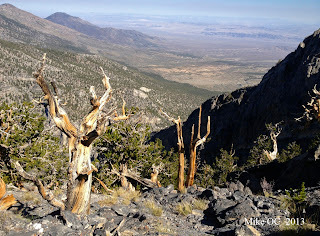 One by one, we reached the top of the ridge which turned out to be just above the Bonanza Trail. Here, we took a small break. 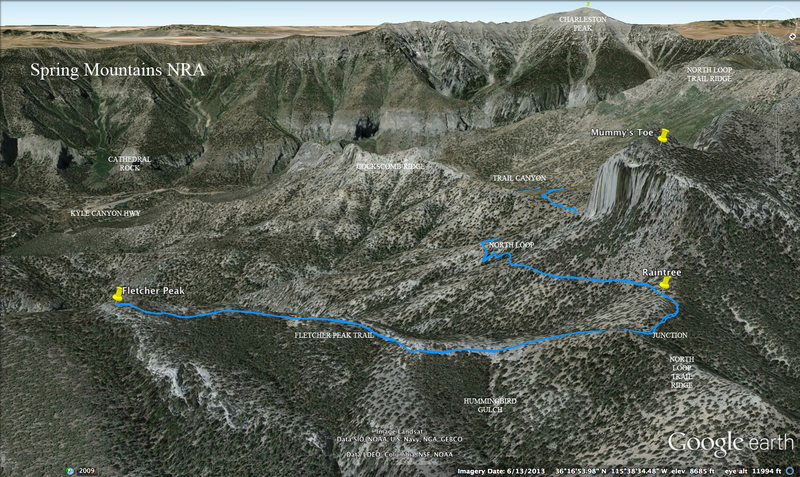 Turning right onto the Bonanza Trail, we found ourselves near the approach to the small peak with a few switchbacks. After climbing over this peak, we continued around to the South Sister ridge junction. 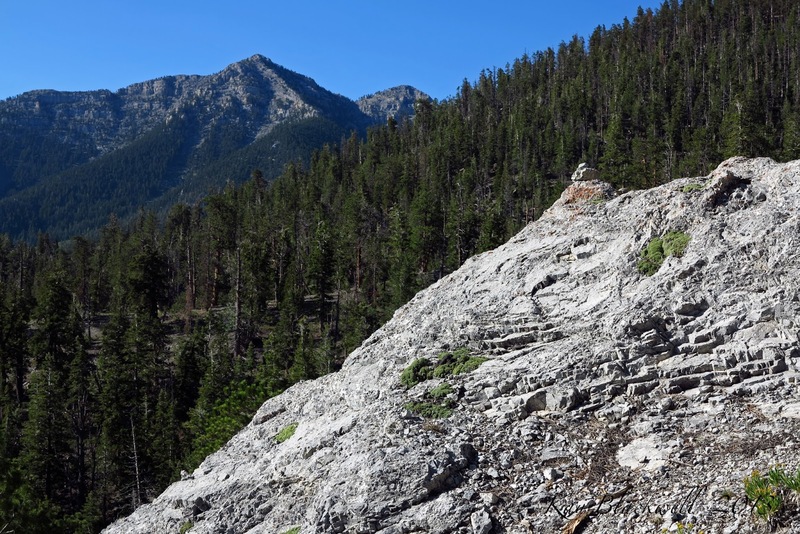 There is a small rock placed on the crook of a three foot stump to the left of the trail where we turned right to follow a small horse trail down to the connecting South Sister ridge. This is a beautiful open ridge with views on both sides. About half way along the ridge to the South Sister Saddle, we stopped for a longer break. Small clouds were just beginning to pop up over a couple of the surrounding mountain peaks. At that moment, we were not concerned about rain. It was still a very pleasant morning. We continued down to South Sister Saddle and, without stopping, we started down the South Sister Trail enveloped in the forest. 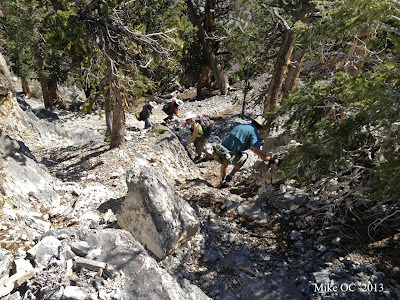 We finally passed the spring (seen in the photo to the left) and the old home foundation (seen below), walked along the rock-lined trail and crossed over and up to the Lower Bristlecone Trail. As we hiked the final bit down the forest road, we could see that the dark clouds were hanging low over Mummy Mountain ahead of us. Time to go home.